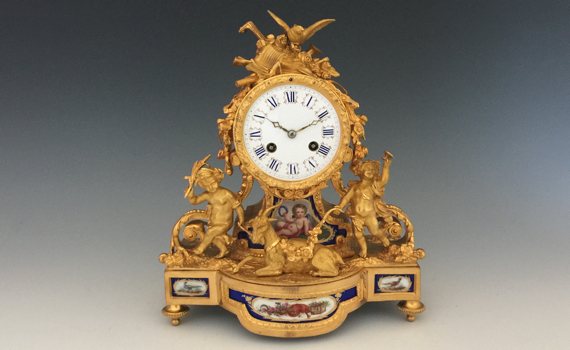 A Napoleon III, French, gilt bronze & porcelain mounted mantel clock in the Louis XVI style. The circular enamel dial with roman numerals, inset a gilt bronze case surmounted by musical trophies & dove, the base with frolicking putti, goat and porcelain panels. The eight day Vincenti movement with Brocot suspension striking the hour & half hour on a bell. Case & movement numbered 330.